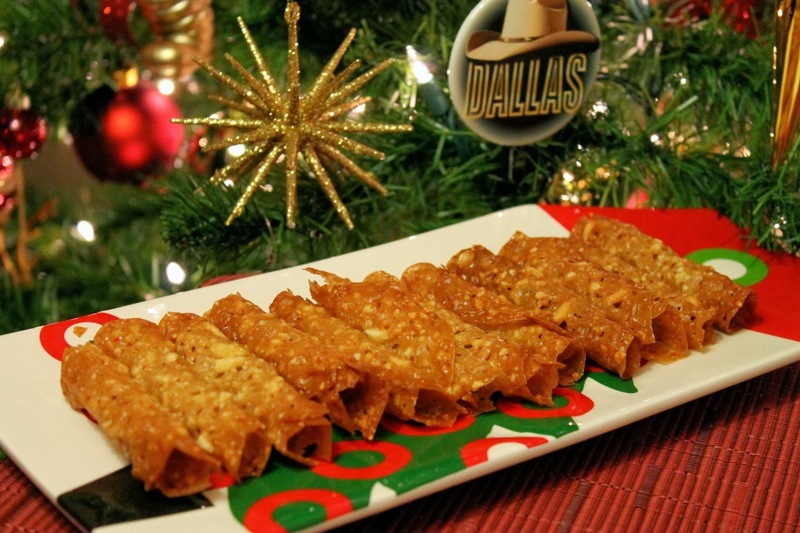 This recipe also appears this week on Dallas Decoder, representing the Ryland family in the Dallas Desserts Holiday Bakeoff II: Ryland vs. Ewing. 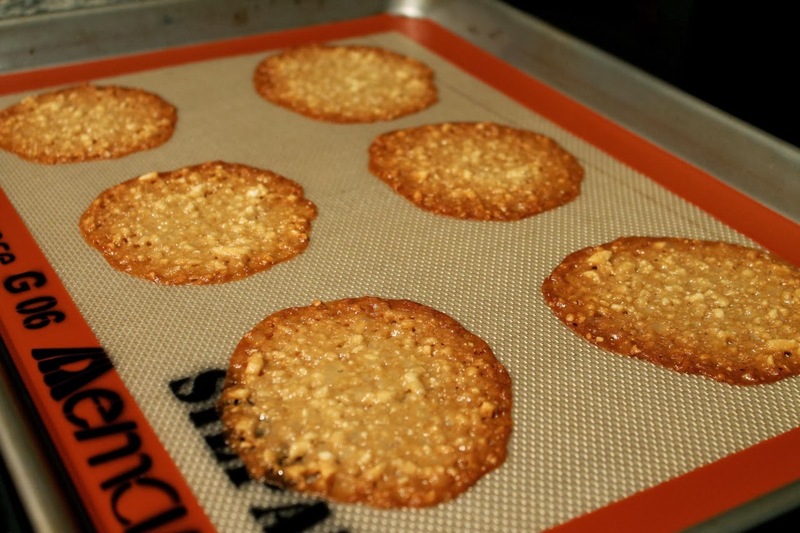 I first had almond lace cookies as a child when one of my mother's friends brought over a batch around the holidays. I thought they were so interesting and unlike any other cookie I'd ever had. I asked her for the recipe, but she wouldn't share it. Given that this was pre-internet, tracking down a recipe back them was not a simple thing if you didn't know where to look. So years later and armed with Google, I was able to finally get my hands on the "secret" recipe for these amazing cookies. The ingredients are quite simple. The trick here is in the presentation. You do not have to roll them up. They may be enjoyed flat, and for the sake of your fingertips, you may want to serve them that way. But they look really cool rolled up. After baking them for 5 or 6 minutes. Let them sit on the hot baking sheet for about a minute. Then, working quickly, use a spatula to transfer them one at a time to a work surface. Flip the cookie over, roll it around the handle of a wooden spoon and then pull the spoon out. Repeat with the others. Be careful as you do this, since they are hot. Try to handle them as little as possible. Finding the window to roll them is the challenge. Take off the sheet too soon and they fall apart. Wait too long and they crystallize and cannot be rolled. It may take some practice to get it right. I bake them in batches of six, since I find that I can successfully roll six cookies before they get too hard. I wouldn't recommend trying to do more than that. I use two cookie sheets and roll one batch while the other batch is baking. 1. Preheat oven to 375 F. Prepare two baking sheets with Silpat or parchment. 2. Combine butter, corn syrup and brown sugar in a medium saucepan and bring to a boil over medium heat, stirring occasionally. Remove from heat. 3. In a large bowl, stir together flour and almonds. Pour butter and sugar mixture into bowl and stir to combine. Spoon teaspoonful-sized rounds of dough onto the baking sheets, spacing them about 3 inches apart to allow plenty of room for the cookies to spread (I recommend no more than 6 cookies per sheet). Bake for 5 to 6 minutes until the cookies have spread and are golden brown around the edges. 4. Remove cookies from oven and allow to cool for about a minute. 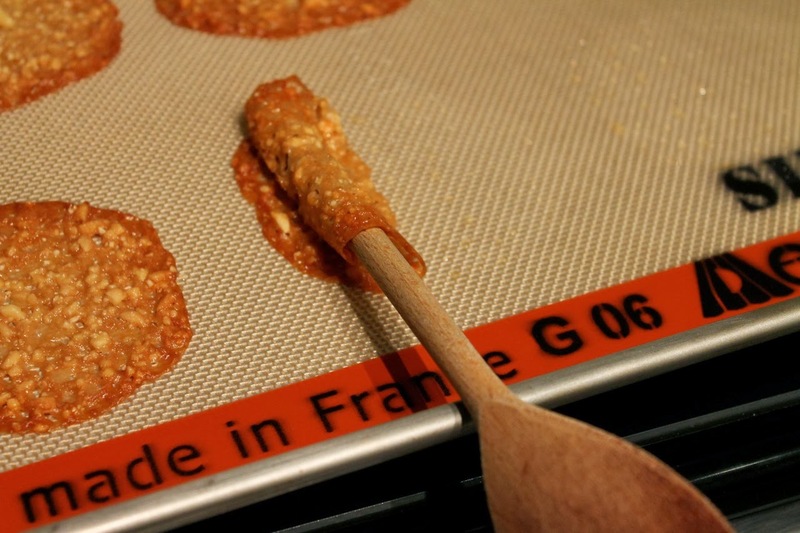 Then, if desired, quickly roll up the cookies one at a time by rolling them around the handle of a wooden spoon. (Careful--they will be hot and you must do this before they get too cool. Finding the right moment to roll them may take some trial and error. Alternatively, the cookies may also be served unrolled.) Set aside to cool completely. I'm not sure how many of your readers are fans of the new "Dallas," but if they are, they'll appreciate "Harris's" description of his mother Judith: "beautiful but brittle." That's just brilliant. Also: These cookies are delicious. Thanks for making them! Thank you Michele! I checked out your recipe. I love the idea of using something similar as a "cup" for chocolate mousse. Sounds delicious.